PLACES, POETS, POEMS, PIGEONS AND PIES – THE VIEW FROM THE BUS. Saturday saw me take part in the maddest thing Writing West Midlands have ever done, their words not mine. The Great West Midlands Poetry Relay, which saw 10 poets write 10 poems about 10 places which were then released to be carried by 10 racing pigeons. When explaining it at the various readings that I attended last week, everyone agreed it was mad, but thought it got surreal when the pigeons were mentioned. My day started at Polesworth where I had written a poem, which incorporated the themes of alternative Olympic events in context of the place. This being a Cultural Olympic event in the run up to the London 2012 Olympics which will start in 12 months time from the weekend of events. 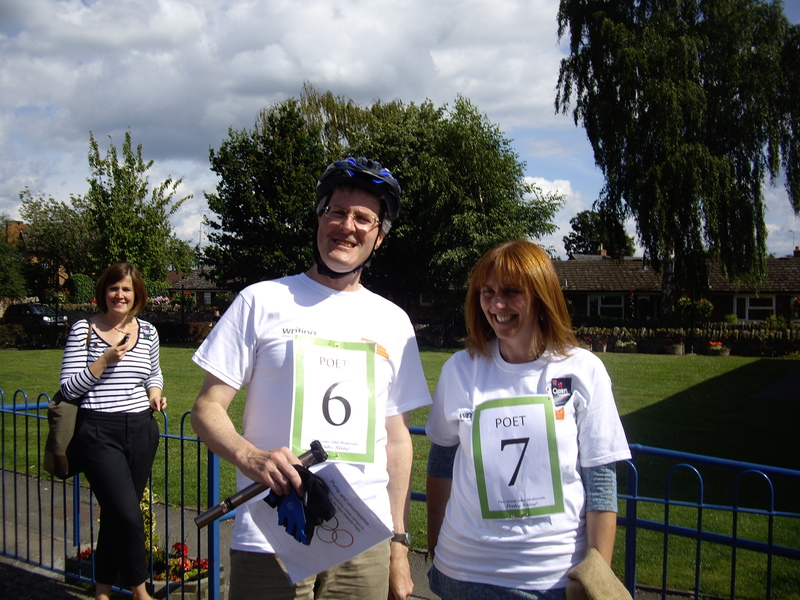 My poem the Polesworth Word Triathlon – used the theme of words coming to Polesworth, with the two poets who preceded me. These words were compared with words that had raced to Polesworth before, such as the words of Thomas Cromwell, which saw the dissolution of the Abbey. The new words however were brought here to compete and were seen to swim in the river Anker and then complete an obstacle course on the Poetry Trail and the events that were going on in Abbey Green Park for the Love Parks day, the final event was flying off into the airways – through Touch FM who broadcast the Polesworth leg of the relay and also thinking about the pigeons who were to carry the poems across the skies later in the day. I had tried to write a comic poem but it just did not work and so I stuck with what I know and used my normal style creating a Free Verse Sonnet (homage to Michael Drayton), but in terms of a sonnet it had 14 lines and a turn part way through, there were no rhymes, couplets or metre – purists may argue therefore that it is not a sonnet. 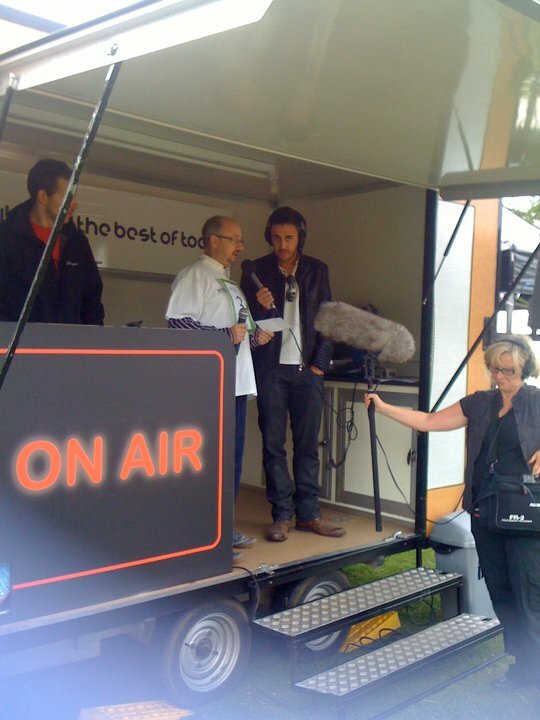 Dressed in tracksuit trousers, trainers and a rugby shirt, the style of the true athlete – I arrived early, to ensure that the team at Touch FM were OK with what was going on and to sort out how we would do the readings across the Abbey Green Park site, where stall holders were setting up for the day and also live on the radio. This sorted, I then went and waited for the bus to arrive with the team from Writing West Midlands, along with the recording team of Peter and Laura from Monty Funk and the first two poets on the relay – Emma Purshouse who had started at Stoke on Trent Railway station at 8:00 am and Philip Monks who was collected at Burton on Trent Library. 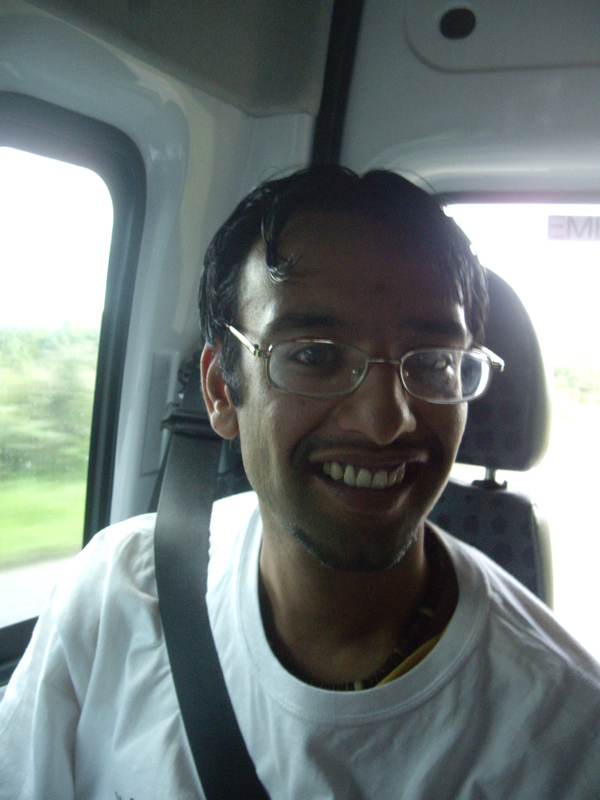 At just after 10:15 the bus arrived, I was given my tee-shirt and number, Poet 3 and my race was on. After a brief interview with Jonathan Davidson on Touch FM, Emma launched into her poem, which was inspired by the Olympic event, The 10 Metre Platform Dive, which she skilfully turned into an event for Network Rail as passengers competed to dive on to trains from the platform. The event being won by Derrick Johnson in his dry cleaned suit, where he not only got GOLD but Stoke also beat Crewe. Emma also picked up the rhythm of a train, reminiscent of Auden’s poem Night Mail. This was followed by Philip Monk’s poem of rolling home from the pub, an Olympic event at which many of us would excel. Comparing the rolling of the Beer Dray wagons with that of the drinker finding the longest way home. Philip used the word jocund in his poem, an interesting word that is rarely used in modern parlance. And then it was me, live on the radio, live across the the park – I read the Polesworth Word Triathlon for the first time. No time for bows or applause – it was on to the bus to the next stop at Hatton Country world, where we were to meet another Polesworth Poets Trail Poet and former Warwickshire Poet Laureate, Helen Yendall. The journey was bumpy as we caught the speed bumps on the road to Dorden, which was whilst I was interviewed on my life in Poetry, which was little off putting and I found myself rushing to say what I want to say between the bumps. Despite a slight detour we arrived at the Hatton Toffee shop to find we had been beaten by the clown performing in the Children’s tent who had taken our audience, alas it is the case that slapstick comedy will always attract the audience away from poetry. Following the reading of Emma, Philip and my poems, Helen picked up the baton with a poem for Hatton – with a series on new heptathlon events, including licking ice cream, shopping and making and throwing mud pies. Then back into the bus to head for Worcester. The journey for me so far had mainly been motorways and the trip to Worcester continued this way, back up the M40 onto the M42 and then picking up the M5. The road rolling underneath our wheels, the miles rushed along. At Worcester we met with Rohit Ballal and performed our first of two indoor performances at the Café Bliss, a venue that sees musical performance but at this time of day was sedate with a few customers including Lisa Ventura, the driving force behind the Worcester Literature Festival, who is was great to meet for the first time, despite us communicating through Facebook many times. Rohit’s poem followed the four previous poems, as he wrote about a Stain Glass making Olympic event picking up on Worcester Cathedral’s need for a new east window. We had a chance to rest a while here and to grab a much needed drink before heading onto the bus to head for the car park at the British Camp in the Malvern Hills. Motorways were left behind for the roads that crossed the battlefield of Worcester, from which Charles II fled to hide in an oak tree, on into Malvern town itself, with is array of shops and Georgian houses and its famous gas lamps and then to the car park at the base of the Herefordshire Beacon. Here we met Adrian Johnson, who had travelled by train having encountered a Jamaican street festival, four zombies and had walked three miles, overcoming his bovine fears in the process. Adrian’s poem which followed the first five, was entitled Pump and Circumstance, and reflected on Bicycles and Elgar and saw the introduction of poets bobbing in the last night of the proms tradition, as Adrian read his poem wearing a cycle helmet and gloves, whilst waving a bicycle pump at the audience that had gathered around the snack cabin. Always a good tip when doing an impromptu poetry reading – find a queue and read to them. The bus then meandered through the sleepy sunshine lanes into Herefordshire to the sleepy town of Bromyard, which traces its history back to Norman times and is now a quiet place where not a lot happens and it seems when it does not many people stir themselves to watch; even though the poets wandered around the town trying to entice people. Here we met with Deborah Alma, whose poem reflected the sleepiness of the town with an Olympic event that involved mainly resting, she stood in a sack, like she was about to enter a sack race, but then revealed that the only hops that they did in Bromyard went into sacks. 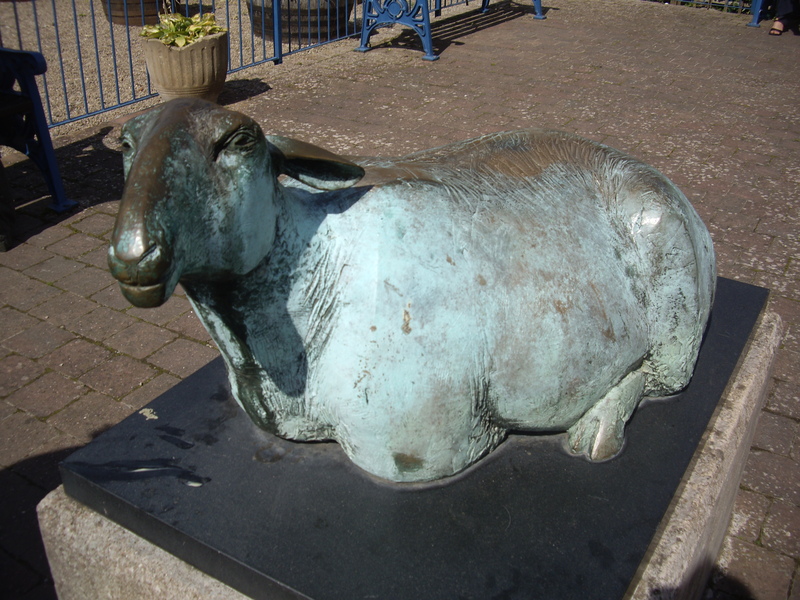 We did manage to rustle up a small audience of locals, including several children on bikes and a bronze sculpture of a sheep whose name appeared to be Ann Jackson. A sheep named Ann Jackson - apparently! We left Bromyard, trying not to make too much noise as we went and headed for Highley in Shropshire, a stop on the Severn Valley Railway. It was here at the leisure centre that we met Kurly McGeachie, whose rapping performance of his poem for Highley featuring coal mining and the Severn Valley Railway, on which he made several puns about freight lifting, encarriagment, training and coaching. – His line about bringing gold back from the Olympics like they did in Britain in Bloom in 2006 was wonderful and made me smile every time I heard it in the subsequent readings. It was from here that the pigeons were released to give them enough time to get back to the loft in Birmingham before sunset, as they would find an alternative roost after dark and this would upset the idea of the poem’s order being decided by the pigeons. The Pigeons are released, their race begins. I have never seen racing pigeons being released before. Ten of them, each carrying a copy of one of the poems. They stepped out of the boxes and took to the air, they circled like a small cloud, following each other, one minute you thought they had gone, then they were overhead again, eventually finding their bearings and heading off towards Birmingham. It was estimated that it would take them 30 minutes to get back to the loft and so we hoped to know which had arrived first by the end of the day. I have since learnt that they did arrive back with the winner being the pigeon carrying Helen Yendall’s poem, my pigeon finished sixth. 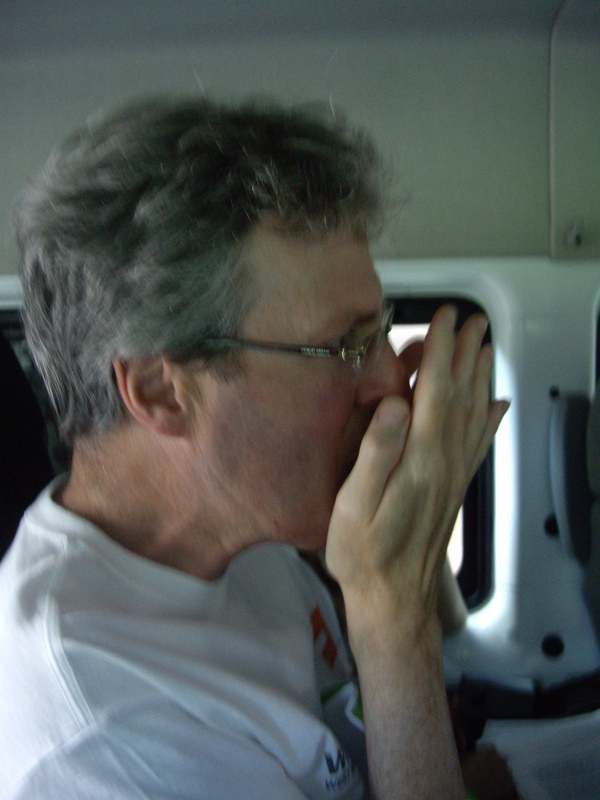 Tiredness and fatigue was now getting to those of use who had an early start and so I was happy to listen as Adrian played his harmonica, Kurly fixed the megaphone and to a discussion on which celebrities’ people had met, names included Brian Mckeenan and Jack Dee. It was like being around a moving campfire at the end of a day of driving poems across country to the rhyme ranch. The drive to the Odeon at Telford was fairly easy from Highley, up to Bridgenorth and then a short hop from there. Here we met the ninth poet Dave Reeves of Radio Wildfire fame, whose poem about long haul queuing was read to the queue for tickets at the Odeon Cinema, Dave came with an array of props all necessary for the competitor in any long haul queuing event, deckchair, snorkel, walking boots, torch, flask, sandwiches and a bin bag. It was here that Rohit overhead a conversation between a Father and Daughter, who on observing a group of poets wandering into the cinema, had asked what was going on, to which he replied “I don’t know darling, but I am sure there must be some explanation”. The queue bemused by the happening, soon returned their thoughts to Harry Potter and popcorn as we headed for the bus for one final time, to the Pie and Ale house in Stafford where our final poet, Roz Goddard was waiting along with our final audience. We arrived just about on time, but by then time was all but forgotten, when we read it was about 8:00pm and it was noted that Emma, who had been on the full trip was reading her Platform poem for the tenth and final time, some 12 hours after it was originally unveiled to the staff and commuters on Stoke Railway station. Roz’s poem was about pie snorkelling as a dressage and Greco-roman wrestling event and finished the day off wonderfully. Sara Beadle captures the ten poets. The final photo of the group of ten showed Roz with a pristine number on her shirt and Emma with a crumpled just about hanging in there number on hers, the rest of us were somewhere in between, the state of the numbers pinned to our shirts may have reflected our tiredness but not the sense of achievement, the team spirit, the camaraderie of new friendships and most of all the taking part. The weather held, the bus didn’t break down, the company was wonderful and the pies were good too. It was a fantastically mad day, and all credit goes to the team at Writing West Midlands, Jonathan Davidson, Sara Beadle, Lauren Davies and the rest of the team for their organisation and making the journey easy for those of us taking part. I would also like to thank Lori Harvey and the team at North Warwickshire Borough Council for allowing us to interrupt the preparations for the Love Parks Day at Polesworth to support the Great West Midlands Poetry Relay. Dave Reeves – Radio Wildfire. There is a review on both Matt’s blog and at Behind the Arras. Also Spoken Worlds at Burton on Trent on Friday has also been reviewed on Behind the Arras. I will not be covering a lost poet this week as I think you will have read enough! 26th July – Poetry Bites – Birmingham. 2nd August – Night Blue Fruit – Taylor John’s – Coventry. 10th August – The Whitehouse – Limerick – Ireland. 19th August – Spoken Worlds – Burton upon Trent. Traffic lights – everyone of them seems to hold me up. The Elford Ale and Folk Festival. My post this week has been prepared on Sunday; this is due to a very busy week ahead. Starting on Tuesday – when I will be M.C. 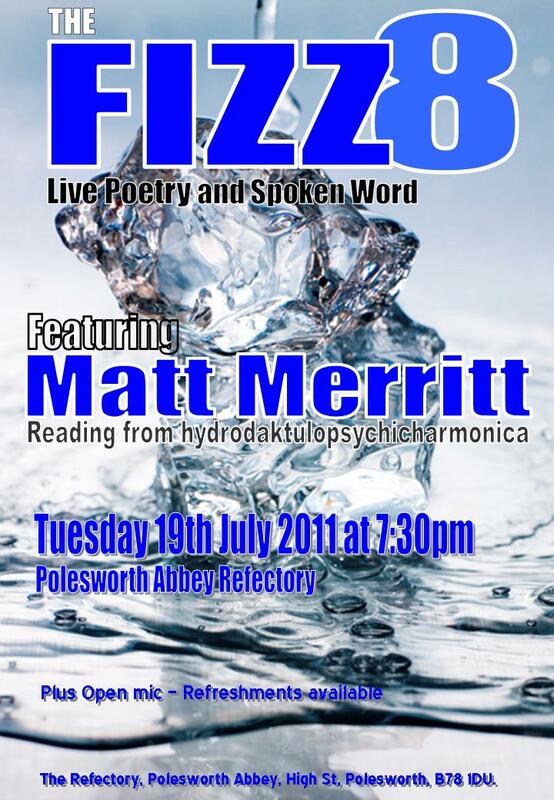 at THE FIZZ at 7:30pm at Polesworth Abbey when I will be introducing the wonderful Leicester Poet Matt Merritt reading from his latest collection Hydrodaktulopsychicharmonica published by Nine Arches Press. Matt is a wild life journalist and this is a major inspiration in his poetry. Matt has been a great promoter of Polesworth as a fan of Michael Drayton, Matt’s blog is at http://polyolbion.blogspot.com, taking its name from Drayton’s great work of the same name. Please do try and come along. Wednesday sees the Mad Hatters Writers in Atherstone and Thursday sees me attending The Runaway writers in Burton. Friday is Spoken Worlds in Burton – it was not last Friday as I had first thought – good job I found out before turning up. 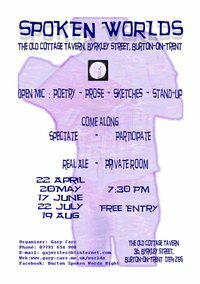 So I will be at the Old Cottage Tavern in Burton, where they serve some fine real ales and once a month Gary Carr delivers Spoken Worlds, a mix of Poetry, Theatre in an event with its now famous “three halves” – I will probably give my Nuneaton Poems as second airing. SATURDAY is the GREAT WEST MIDLANDS POETRY RELAY, which will see ten poets of which I am honoured to be one of them, travelling around the Midlands writing poetry in a relay race with one poet passing the baton to the next poet who will add the next part of the poem. The relay starts in Stoke on Trent and then on to Burton On Trent, The next stop is Polesworth where I will take the baton before I pass it on at Hatton Country world, following with Worcester/Droitwich, Malvern Hills, Bromyard, Highley, Telford and finishing in Stafford. 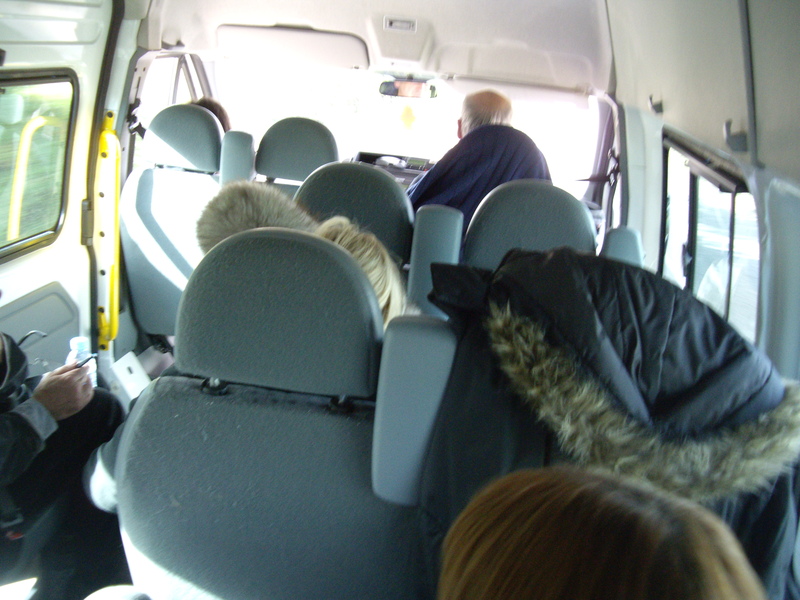 The Poets will travel on a minibus being collected as they take the baton, The poem will be read at each of the locations as it grows on it journey around the Midlands. The ten parts of the poem will be attached to ten pigeons from the Birmingham Pigeon Project and released in Stafford, back to the loft in Birmingham, the final order of the poem being decided by the order in which the pigeons arrive back at the loft. The event is part of a series of events organised in the run up to the 2012 London Olympics as part of the Cultural Olympiad. I am really excited about taking part in this journey, meeting and working with the other poets, which at the time of writing I do not know who they are, which makes in even more intriguing and of course the final order that the pigeons bring in the poem. I will write more on the blog next week about the experience. For more information of times and destinations then check out the following website and if you can be in any other locations to hear the poem being read then please do turn up to be part of the audience at these unique poetry readings in these unusual poetic places. My lost poet this week is a Bush Poet from Australia. Most people’s experience of Bush Poetry is the song Waltzing Matilda, with its tale of the bushman brewing his tea, when a sheep appears, which he takes to eat only to be caught by the owners and three policeman and it ends with the bushman committing suicide and forever haunting the place, it was written as a poem by Banjo Paterson in the 1890’s and later put to music to become an unofficial anthem of Australia and all things Australian. It seems strange that such a sad tale should come to be a representative identity of a nation; it’s maybe the way that singers seem to perform it in such a jaunty almost comic way. It does however have a myriad of words that are quintessentially Australian, Swagman, Billabong, Billy, Coolibah Tree, Jumbuck and Tucker and even the title Waltzing Matilda, which is slang for walking on foot (Waltzing) with a bag on your back (A matilda), or dancing across the country with your bag as your partner. Which makes sense of some of my parents sayings (although they were English), instead of asking where I was going, I was more likely to be asked where I was waltzing off too. Bush poetry is full of these types of rhythmic poetic words, that are poetry in there own right without any need to put metaphor, simile, alliteration or any of the other poetic devices around them. The origins of Bush Poetry is as an expression of everything Australian – the landscape, the language, the cultural identity coming from poets who lived in a nation defining its identity. It is a very definitive poetry of a specific place, the spirit of which is encapsulated in the words and slang, which reveal the cultural motivations of the people. If I were to use these words to describe Warwickshire, they would just not work. Banjo Paterson was born Andrew Barton Paterson in 1864 in New South Wales, growing up on remote farmsteads in the outback, surrounded by wide open spaces where horses were the main form of transport, this was to become much of the themes of his poetry which he wrote from the city, where he was a lawyer. He was educated firstly by a governess and then when he had learnt to ride a horse at a bush school. Later he attended the Sydney Grammar School where he excelled in his studies and as a sportsman. From here he became and articled clerk as firm of solicitors and by 1886 was admitted as a qualified solicitor. In 1885, he started submitting poetry to the Sydney edition of the Bulletin under the pseudonym of The Banjo after one of his favourite horses. In 1890 he wrote one of his best known works The Man from the Snowy River, which was taken to heart by the nation, this was followed by a collection under the same name. 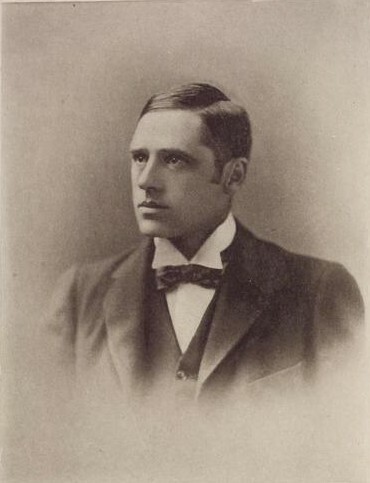 He became a war correspondent for the Sydney Morning Herald and the Age during the first Boar war which saw him sail for South Africa; on his return in 1903 he married Alice Walker, with whom he had two children. It was in this period that he published a collection of Old Bush Songs in 1905. During the 1st World War he failed to obtain the position of a war correspondent and instead volunteered as an Ambulance driver, serving in France where he was injured and for a time reported missing. Later in the war he was stationed in Cairo, Egypt. When he was discharged from the Army in 1919 he had attained the rank of Major. He died of a heart attack in 1941 and it has been said that in his lifetime he was second only to Kipling as the most popular poet writing in English. A part from Waltzing Matilda and The Man from the Snowy River, his other notable poem is Clancy of the Overflow. I am discussing the work of Banjo Paterson as a way of introducing Bush Poetry, as he wrote a piece that has a more global recognition. Other worthy poets who are from the Bush Poetry school are; Dorothea Mackellar (1885-1968) key works – My Country; and Henry Lawson (1867-1922) Key works – Freedom on a Wallaby, The City Bushman and Up the Country. I chose Bush Poetry for a couple of reasons, the first being that it is poetry of place, full of the spirit of the place, which is of particular interest to me for the themes for my own poems. I also chose them because the Australian Bush Poets Association (ABPA) is based in Tamworth, New South Wales, which is also close to my heart as I live in Tamworth Staffordshire. ABPA continue the traditions of Bush Poetry, through promoting poets such as Banjo Paterson, but also in developing new voices of the modernist Bush Poets. Here are some links for the Bush Poets. The Man from the Snowy River – By Banjo Paterson. Banjo Paterson’s biography at all down under. 19th July – The Fizz 8 – Polesworth Abbey. 22nd July – Spoken Worlds – Burton upon Trent. 23rd July – THE GREAT WEST MIDLANDS POETRY RELAY. 8th August – O’Bheal – Cork – Ireland. IS IT, THE JOURNEY AND NOT THE ARRIVAL? Having to learn HTML because my website won’t do line breaks. The Rock Houses at Kinver. My thoughts this week are turning toward doing a major new project, this will be a personal project involving film, sound and poetry with may be other artistic mediums such as dance, if it develops into something that allows for the incorporation of these themes without diluting or compromising the piece. This is something that I have been thinking about for sometime and at this stage the ideas are only as stated above, something with film, sound and poetry. There is no story or theme, no idea for sound other than experiments to create audio vistas that are not music, although they make have some musicality about them. No ideas for the film, other than the images should challenge the viewer to make connections; with the words and sound and their personal experience. I want to almost take a space and create a spirit for it that lives in the space for the period of the performance. I see the process as something organic that grows through the process of developing it; this will be a ritual piece, where the development of it is perhaps as important as the showing or performing of it. But then, I do tend work this way on my own pieces, such that the writing or filming is a process of bringing forth new learning, new understanding and most of all the pleasure of the subject. Immersing myself in the culture, heritage, ideas, philosophies, people and place. The process usually starts with Google, searching out obscure references, looking for the unusual little know fact, then forming an idea which then goes into the thinking and walking phase where quite often the original fact is lost in the depths of the journey to the final piece. I visit places and talk to people, find the spirits adding in their stimulus to the piece, each thread on its own bobbin, like wool or cotton, spun from different sheep or different plants coming together in a single piece of cloth, then cut and sewn into a fine fitting garment, the source of the threads become distant and remote, lost. It is the experience of the process of the development that gives a full understanding of the finished piece, this is often lost to the audience who views it as a completed composition – sometimes such that they do not understand it, cannot see how one motif overlaps with another, how one set of words arrive at the point that they do and why it is important that they come in at the precise point. With sound and film imagery we have become accustomed to fast moving beats and scenes, there is a formula used in the industries, which churn out thousands of hours of popular culture nearly every day. The idea of 2 minutes 45 seconds for a sound came out of the need for records to be played on the radio and this was deemed as getting as much coverage and radio play for a variety of artists. But this in turn has changed our ways of thinking, changed our expectations. I want to break away from this, with sustained images and sounds, I want to stand on the mountain top and listen and stare and I want it to last longer than 2 minutes 45 seconds. You don’t go through the dangers and physical exertion in climbing the mountain to stand there for 2 minutes 45 seconds. For me it is always the journey and the experience rather than the arrival, I want to change this for me, such that the arrival is something that sits on top of a mountain and has a knowing, understood, recognised presence. I hope to share some of the journey with you through this blog. Let’s see where it goes. Congratulations to Sarah James, one of the Poetry Trail Poets whose first collection “Into the Yell” has won third prize in the Rubery International Book Awards for 2011. This is a fantastic reward following the hard work in developing and just recognition for a wonderful poet. There is no resting up as Sarah is now joint editor of BE Magazine, which is part of the Worcester Literary Festival. It will be an on-line publication initially but is planned to be produced as a hardcopy in the future. The magazine is open for submissions and can be found at http://www.bemagazine.co.uk – check out the submission guidelines for details. Whilst I am discussing Worcester Literary Festival, congratulations also to Lisa Ventua on what was an excellent festival in Worcester, with the right mix of established writers and grass root aspirations – an inspirational approach – I will watching out for new work being developed as a result of this mix of experience and ambition. Barbauld was born Anne Letitia Aikin in the village of Kibworth Harcourt, Leicestershire, her father was the Head teacher at the dissenting academy and the Minister at the nearby Presbyterian church. In her childhood she was surrounded by the boys who attended the school, whose boisterous ways she was to adopt much to her mother’s disapproval. She also had a great thirst for learning, again her mother thought this um-becoming of a young woman, who she feared would find it difficult to find a husband as someone with learning who could articulate an opinion. This was a comfortable upbringing which saw the family move to run the academy in Warrington, where she was to meet her husband a descendant of French Huguenot’s, Rochemont Barbauld. It was shortly before her marriage, that she published her first collection of poem, entitled simply as “Poems” (1773), this was to receive much critical acclaim and went into four printings and built her a considerable reputation as one of the best literary voices of her time from this single first collection. Her poems covered many themes and were to provide great inspiration to later Romantic poets such as Coleridge and Wordsworth. It has been suggested that women poets in the Romantic period, had a distinct literary voice and further that Barbauld as a dissenter had a unique voice among her contemporaries and that she therefore from her outsider position had a duty to write social commentary. Fearing that she and her husband may never have children of their own, they adopted one of her brother’s sons, following which, she then began to write educational studies for children, inspired by the need to educate her adopted son. She became involved in politics in the 1780’s, writing essays on themes relating to repeal laws on the rights of Dissenters and on the abolition of the laws relating the Slave Trade in support of William Wilberforce, whose bill to abolish the slave trade had just been rejected by Parliament. She was concerned about the Nation taking responsibility for its actions and that each individual should be responsible for the acts of the Nation to which they attached their allegiance. Her marriage faced difficulties in the early 1800’s when Rochemont’s mind became unstable which resulted, fits of anger all pointed towards Anna and in his eventual suicide in 1808, leaving Anna distraught. In 1812 she published a poem Eighteen Hundred and Eleven, on the verge of the Napoleonic wars. Her satirical anti- war poem described Britain as a power in decline and that America as the power in the assent. The poem was vilified by the critics, which shocked her so much she refused to publish any of her further work. She was lost to literary world and this was finalised when the Romantic poets who had once lauded her as an inspiration, abandoned and dismissed her, now that they were the leading lights in the literary world. She remained unread until the 1980’s when feminist critics started to review her work and to put her in her rightful place of one of the best poets and writers of her generation. 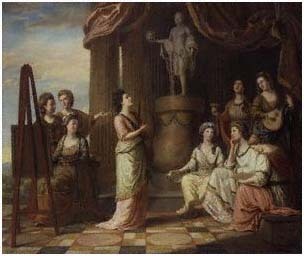 The image at the top of this section is the Nine Muses of Great Britain (1779) by Richard Samuel. Anna Letitia Barbauld is depicted standing at the back by the easel gesturing with her left hand. Below is one of the most powerful verses in the poem Nineteen Hundred and Eleven, powerful for its prediction on things to come some 100 or so years later and powerful because one can but think that it still holds as true today as it did then. Which sickness, only of the soul, precedes. The tempest blackening in the distant West. Some links and further information. Eighteen Hundred and Eleven at project Gutenberg. Anna Letitia Barbauld – The Voice of Enlightenment – By William McCarthy (Amazon Page). THE FIZZ 8 with Matt Merritt is coming up on the 19th July as Polesworth Abbey, please do try and come along and here Matt read his poems from nature. 15th July – Spoken Worlds – Burton upon Trent. THE FRUITS OF THE POETREE. People who can’t flex themselves away from their own agendas! This last week saw the culmination of three months work to organise the Nuneaton Summer Poetry day with the event itself. The day started early and I arrived in the town to see the market team installing the last of the blue and white gazebos that make up the covers over the market stalls. They had been up far earlier than me to get them all into place so that the stall holders could set out their tables and start displaying their wares in time for the first customers who were starting to enter the town by 9:00. As I said, I was early so headed to a coffee shop to grab a much needed eye-opener and to write my first two poems of the day ‘Early’ and ‘Coffee at 9:00 am’, I was joined by my partner in crime for the organisation of the day, Rach Flowers, who was dressed in her spectacular black dress and boots that any female Goth would be proud to wear. We proceeded to meet the artists from Art Alert who were decorating the benches, inspired by poems that I had provided them, from Michael Drayton to Wordsworth to Blake and some modern poems, including one of my own, one from Mark Niel, the minstrel poet for the day. The benches were covered with cushions made from wall paper and included a newspaper inside of which was a copy of the poems that they used to inspire them. It was interesting to watch to town folk as they were unsure whether they could sit on the benches and Art Alert had to put up signs to say “Please Do Sit on the Benches”, which I am sure one or two people managed to put the word “NOT” into when they read it. 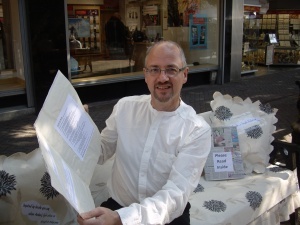 The easiest way was to lead the way and sit on the bench with my poem on which I had my photo taken. This seemed to do the trick and before long people were sitting on the benches and reading the poems in the newspapers. I managed to get some words to use in a poem from the Art Alert team and very soon had the basis for my third poem ‘Benches’. Art Alert also brought along a bright blue tree from which we hung poetry kites and other poems to make our Poetree, it was originally planned that the bench poems would hang as fruit from the tree, but as these were now in the newspapers, the tree was a little bare at the start of the day, but as the day progressed the poetry kites became the leaves and fruit and added to the colour of the day. My base for blogging was the Community Café, which was proving a difficult venue for people to perform as the local people were not sure what to expect, Colin King was holding court in this location story telling and engaging with his audience, getting them involved with where the story went next. I wrote the poem ‘Community Café’ as I sat and updated the blog, using the line ‘bending his words around the ears of Saturday’, where ‘Saturday’ is used as a collective noun for all that normally goes on in the town on Saturday, the market, the shoppers, the meeting of friends, they are always there. Colin made full use of the space walking through it and projecting his voice with its wonderful Irish lilt. It is certainly as sense of theatre that helps to engage an audience; Colin was never static and could not be totally ignored. This highlights the difficulty of working in such spaces, many poets read at poetry events, where they have an audience that has come to listen, an event such as this is challenging because most of the people have come to do their shopping, meet with friends and do their normal Saturday routine. Poets and story tellers can be ignored, unless they provide something that captures the imagination. People don’t necessarily have to stop to listen; they can still wander along hearing the words as they float through the market stalls. There is also an argument that reading a poem out-loud in the street or anywhere is a ritual and that it does not matter whether anyone is listening, purely reciting the words as an act in itself is a worthy thing to do. People like, the Brazilian Poet Márcio-André de Sousa, who I had the pleasure to meet in 2009 when he filled the Tin Angel Bar with sound poetry at Night Blue Fruit in Coventry. He ventured out to the Chernobyl Nuclear site in 2007 on what many considered a suicidal trip, purely to read poetry to the landscape, to the shell of this devastation, which he did for six hours. What ever your thoughts on performance and the need or not for an audience, then I think events such as Nuneaton Summer Poetry Day needs to cater for both; those who see it as a ritual and those who want to engage with an audience, things to be considered for any future event. The idea of a collaborative poem came to me quiet early in the process, I did it back in March with the Children at Birchwood Primary School in Polesworth, where we played with Kite Poetry and they gave me words to form the basis of the collaborative poem to be used on the poetry trail. I really liked the idea of words coming in to Nuneaton from all over the world and then being shaped into a poem that in some way reflected the day. Calls for words were put out on Facebook and Twitter and through the blog. Face book friends passed it on to their friends, and thanks to Gary Longden who really took hold of the idea and sent it to his friends in far distant places, many of who responded. I was interested in the words where they would come from, who else was thinking about Nuneaton and poetry, but could not come to the town itself, I wanted part of the festival to be accessible through the web, that it was a global event with its heart in Nuneaton. I received words from across the globe, the farthest being from Waipu on the North Island of New Zealand 11,269 miles away, from the words provided I composed the poem ‘In a Single Moment’ which drew its theme from the 60 second slam and the idea that whilst the poets in Nuneaton were performing then around the world at the same time the other events were taking place. Unifying a set of individual acts in to the events at the Poetry Day. It seemed to me that the words were just as important as the places and the people who had sent them and that the poem should reflect this. Since the day itself, another poet has also taken the words and created her own poem, which I hope to post on the blog in the next few days. My last poem posted on the day was my poem ‘Nuneaton’, which I will admit was written in the days on the run up to the event rather than on the day itself. The reason for this was that I wanted to present the town with a more crafted poem, but also get my mind into the right state for writing as in the weeks running up to the festival I have not written much apart from this blog. The poem uses the River Anker, which runs through the town but has been diverted under the streets and so as you wander around you may not know it was there, it uses the poet searching for the river on market day as its theme, and how this once sparkling ribbon in the landscape has now been replaced by the glints from the market stalls, until the poet spots the movement of the people and reflects that they flow as if mimicking the river. The day finished in the Crown pub with an open mic, compered by Milton Keynes Poet Laureate Mark Niel who organised the slam and kept things flowing at the Fountain poetry stop. The night ended with music from the Folk band, Folklaw who were excellent and should not be missed if you get a chance to see them at festivals and venues around the Midlands. My Lost Poet this week is not so much lost but yet to be discovered by most, despite having a well respected international reputation. Marcio Andre (1978- ), as I mentioned above he is a amongst other things a sound poet, sculpting not just words but the manipulation of echoes, reverberation and sustained waves of sound into audio vistas. This is not music and poetry, not talking over a jazz drum and bass line. The sounds that Marcio Andre produces often do not sooth and seduce the ear when they start, they often differing clashing sounds which as the piece progresses merge into an audio vista, which has all the wonder of the earth being formed. You have to stick with them, let yourself become accustomed to them, let you mind have time to work out what is happening and how to respond. A tree grows so slowly that we do not hear it and we can appreciate the full grown beauty of it as it takes its place in the genius of the landscape. Yet if it grew from a seed to a full grown tree in seconds, morphing from the land, then all the sound that it makes as it grows happens all at once and every creak and ache would rupture the air filling it with sound as if something was being destroyed. The end result would not be any less beautiful, still the tree, still in its place in the landscape, but the noise would resonate and maybe change how we view the tree. To me Marcio-Andre does this with his sound poems, providing us with the opportunity to stand in the landscape or enclosed space and hear things that we would not otherwise hear or even conceive. Marcio-Andre is the first living poet to be included in this list, he has a significant body of work for his young age and is still developing, experimenting and following his thoughts, it is therefore inappropriate from me to try and encapsulate him as the poet in a few paragraphs, it is best that you search him out for yourself, on the web and in performance. If you get the chance to hear Marcio-Andre sound poems live then it is an experience not to be missed, there is a video on website (no 7) of his performance at Night Blue Fruit at the Tin Angel, but it doesn’t capture the electric atmosphere of actually being there, the building, the shabby furniture and the audience were all part of the experience, it was as if the whole performance was viewed and heard from inside the loud-speaker, that you were not an observer/listener, but you were a channel for the sound, a biological-amplifier that was plugged into the sound system.